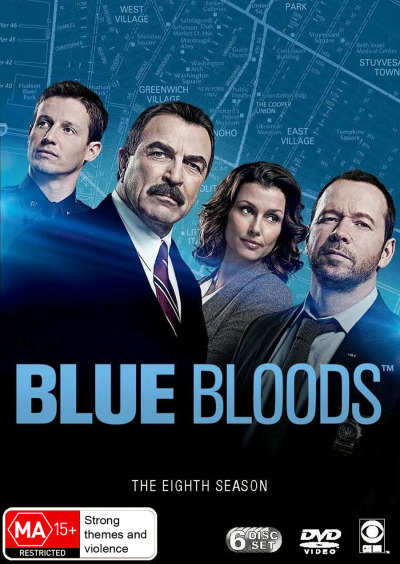 The Blue Bloods season 8 DVD is the 2017/18 season that stars Donnie Wahlberg and Tom Selleck. The Blue Bloods 8 stars with Danny contemplating retiring until Erin enlists him to help her with a case involving her ex-husband. Frank, the Police Commissioner and son of former PC Henry Reagan, must balance his duties of running the largest police force in the world and being his kids' boss. His daughter Erin is an Assistant District Attorney, son Danny is a senior detective and fellow Marine Veteran and new Harvard Law graduate turned policeman, Jamie all swirl through this family drama and passionately defend their city from harm. The Irish-American family is deeply rooted in their patriotism, passion and love of family. Best Producers, Best Actors, Best Series currently on T.V. Keep it coming, we do not miss at our house, should be on more often in prime time T.V. Probably the best drama out there. Click the button below to add the Blue Bloods - Complete Season 8 to your wish list.